Here's a story that hasn't been told for over 20 years and a 2Pac photo that has never been seen until now. "And that's when Tupac put up his 5 fingers"
SIGNAL HILL, CA, July 02, 2017 /24-7PressRelease/ -- In late August 1996-just two weeks before Tupac was shot and killed in Las Vegas, Delray Richardson, took his two home girls Nanette Nick and Ingrid Hicks from Maryland, sight seeing in sunny California. Driving west on infamous Hollywood Blvd, they made a left on La Brea and got stuck at the light on Sunset Blvd. and La Brea Ave. There, Delray spotted the black Hummer and said to his friends, "There's Tupac right there in his black Hummer" as he was making a right turn onto LaBrea from Sunset Blvd. That's when Nanette and Ingrid yelled, "Catch up to him Delray!". Delray calmly said, "It's all good, I got you!". As they pulled up alongside Tupac at the red light on Fountain and La Brea, Delray said, "Yo Pac, these are my homegirls from Maryland, they wanna take a picture with you." 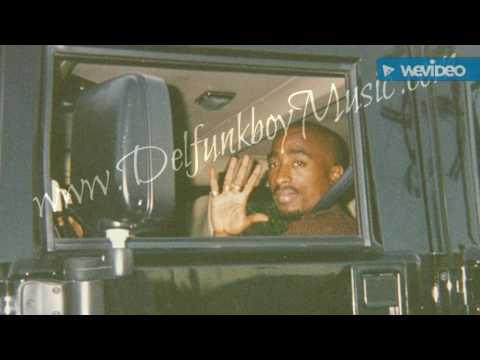 Tupac kindly said, "I can't get out of my car because there's too much traffic." So Delray grabbed the camera and passed it to Nanette and said, "Take a picture, it's better than nothing". At the same time, Ingrid said to Tupac, "Tupac, can I ask you a question and he replied, 'Sure baby'". Ingrid said, "How many times did you get shot?" And that's when Tupac put up his 5 fingers and said "Five," as Nanette simultaneously snapped the picture. And that all took place while stopped at a red light in Hollywood. Tupac was shot on September 7, 1996 in Las Vegas and passed away on September 13, 1996 from the gunshot wounds. Now here's the professional connection-in 1996, Delray Richardson co-writes a melody that becomes a Tupac Shakur song that Tupac completes just weeks before his death. That song, "One Day at a Time," then unreleased, was covered by Eminem and the Outlawz on the Tupac Resurrection movie soundtrack which earned Richardson gold and platinum records from the Recording Industry Association of America for selling over 2 million copies. Richardson was embroiled in a copyright dispute with a former business partner over "One Day at a Time." Richardson's copyright on the music saved him from having to litigate against his former business partner. The original version featured just Tupac, before Eminem wrote & produced his version for the Tupac Resurrection soundtrack. There's also a unreleased version titled, Rise' "One Day at a Time," featuring Rock & Roll Hall Of Fame inductees Tupac and Grandmaster Melle Mel, Delray is also featured on that version. Richardson is also named a co-writer of the song "We Ain't," featuring Eminem, after Eminem sampled "One Day at a Time," for The Game's debut album "The Documentary," earning Richardson more gold and platinum records from the Recording Industry Association of America as the album sold over 6 million copies. Delray is one helluva artist in his own right, as his latest project "Mahogany Masterpiece," is considered a "musical masterpiece" according to the Baltimore Times.